The smartwax website has been re-vamped , We have included a link to the poor-boys online store as well as a CG page.You are most welcome to sign up for free on the site and the first 50 members will recieve a free Smartwax or Cg product and also enjoy cool discounts when purchasing a smartwax or CG product for just being a member. 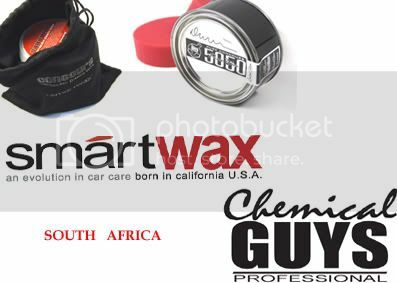 Who ever registered on the smartwax.co.za website please mail me your details that you logged in with followed by your address so i may post out the sample products. website had a slight bug. Every one`s info is collected, the samples will be posted during the course of the week. All sample product was sent out last week. Please keep me posted if any one has any hassles. Gonna go check my PO box now!!! sample of Smart Leather received ... Mmm ... Smells like leather !!! SmartLeather cleans and conditions all fine automotive leather surfaces in one easy step. As it cleans and conditions, SmartLeather moisturizes and restores the natural leather fragrance. The special cleaners in SmartLeather gently cleans without stripping leather of its natural oils and moisture. Regular use prevents the need for heavy cleaning. SmartLeather is a pH balanced formula that replenishes the essential, natural nutrients that keep natural leather soft and supple. When used on artificial leather surfaces, SmartLeather prevents fading and cracking. Automotive leather is under attach every hour it is parked in the sunshine. Extra-strength UV protection makes SmartLeather the ideal choice for convertibles and vehicles that are exposed to the sun for long durations. SmartLeather leaves a natural-looking finish that isn't greasy or slick. After wiping on, it quickly dries to the touch. Formulated with stain repellants and waterproofing agents, SmartLeather prevents stains from everyday use. I received my sample last week. Got mine last week, smart dressing, only prob is that i have purchased the full sized product not too long ago! lol! thanks naush!